Cannabidiol is a chemical compound found in the Cannabis plant known as Hemp. Hemp CBD oil does not produce any psychoactive effect, and is legal in all 50 states. It does, however, hold the highest medicinal value. Farming and cultivation are growing rapidly as cannabinoids are bringing safe, effective relief to patients who suffer from seizures, epilepsy, and cancer. Cannabinoids are also extremely anti-inflammatory, making them excellent for use directly on the skin, as a Zagorska client recently learned. Hemp CBD oil contains essential fatty acids and offers an enhanced ratio of Omega 3 to Omega 6 fatty acids compared to other oils. Omega 3 is great for smoothing and firming skin, and helps improve the skin cell’s structure and gets rid of waste products. Its silky texture makes skin feel refreshed and youthful. Hemp CBD oil also contains several vitamins great for skin! Vitamin E is an antioxidant, which both protects the skin and can improve tissue repair and growth. Vitamin C improves elasticity, tone, and brightens the skin, as well as builds essential collagen complexes. CBD oil also contains Vitamin B6, which promotes firmer skin, and amino acids which help the skin generate collagen and elastin to prevent wrinkles, and allows the skin to maintain more moisture. Amino acids are especially soothing and healing for dry skin, eczema, rosacea, acne, and psoriasis. CBD contains incredibly powerful antioxidants even surpassing those of Vitamins A, C, and E, making it an incredible force against free radicals which cause oxidative stress that can lead to internal and external damage from pollution, preservatives in food, and even emotional stress. 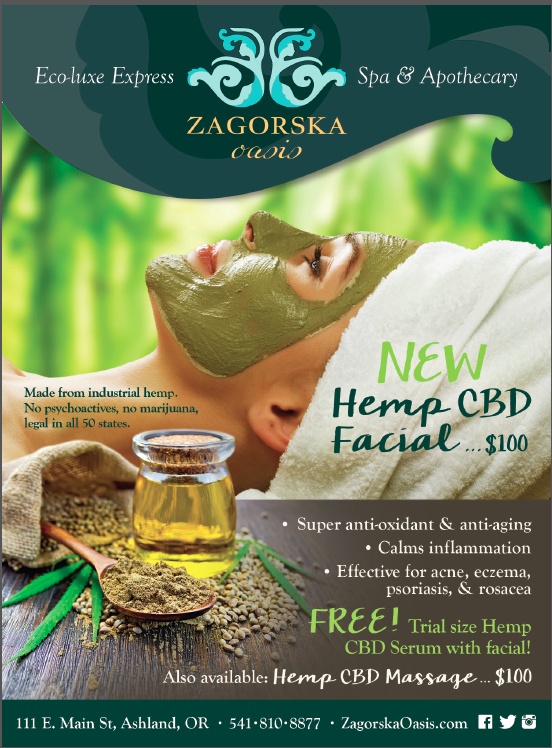 Zagorska now offers an exciting array of face and body care products containing Hemp CBD oil, as well as luxurious Hemp CBD massages and facials. In addition, we stock nano-enhanced hemp oil in the retail section of the spa. http://zagorskaoasis.com/cbd-skin-care/. http://ashland.oregon.localsguide.com/wp-content/uploads/2017/08/Screen-Shot-2017-08-29-at-9.57.08-AM.png 748 552 Zagorska Oasis http://ashland.oregon.localsguide.com/wp-content/uploads/2018/05/logo-1-300x76.png Zagorska Oasis2017-08-28 19:18:092017-08-29 09:48:16What is CBD and What are the Benefits? What are we doing at the first visit?! Introducing Dr. Mark Force DC.